So, according to recent blood test results, I have abnormally high liver damage indicators in 3 areas. No one has really explained the areas to me, but the fella who passes as my most regular doctor (having been through a dozen random people at clinics over 20 years) seems to think it is “substantial”, meaning I can’t just joke it off and ignore things. Having drunk my fair share of booze since 1984 I guess it shouldn’t be surprising, but I’m annoyed regardless. I never get stonkered but grog has been a part of my life for a long time and the affects may have added up. My best mate Nick used to go toe-to-toe with me and he had stomach ulcers for years, and yet I’d seemingly escaped unharmed. The “plan” is for me to drink half my normal amount for 3 months and see what changes. It might not even be related to booze. The health insurance agent heard this and only just stopped short of calling the doctor recalcitrant for what she considered was a grave illness. Let me recap: Never been in hospital, never broken a bone, never had more than 3-4 days off work (in a row) in 26 years. I found an online booze counter and have been plotting my progress and counting my drinks fastidiously here. The only problem is that I don’t have a great record of what I drank before, but I would drink an 8% longneck a few times a week, followed by a stubby (6 std. drinks) so I’m very certain it’s gone down. So far my biggest drinking day in 2 weeks has been 4 standard drinks, which is the equivalent of 3 stubbies. To top it off, a shipment of Belgium’s finest arrived last week. 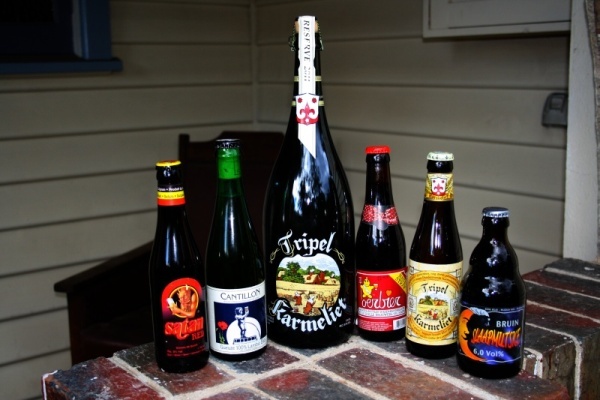 A six-pack of each of these, plus a monster 1.5L 8.4% Tripel that I will need help with. I’ve sampled one of all, and the unlikely winner was the Oerbier, a 9% malty-plum-pudding-topped-with-orange-and-brandy-with-a-sour-cherry-finish sorta beer. One of the most amazing I’ve had. I’m still in raptures about it 24 hours later. Well…it may just become an awesome ornamental bottle, but I doubt it.